The Huron-Wendat of Wendake (formerly called the Hurons of Lorette) originally came from the Georgian Bay region. Until the middle of the 17th century, our ancestors occupied a vast territory straddling part of what is now of the United States (from Detroit as far south as Oklahoma), south-eastern Ontario (Penetangueshene and Midland) and Quebec; they hunted and trapped throughout this territory (mainly in the Laurentian Mountains, between the central section of the St. Maurice River and the Saguenay). Between 1634 and 1650, the Wyandot Confederation was dismembered; its families, having been gathered into four (4) or five (5) tribes, were dispersed. It is estimated that the Huron population totalled approximately 20,000 to 30,000 people in 1634. By 1650, only a few hundred individuals remained. Most of the rest had been decimated by epidemics or had perished over the previous twenty (20) years in wars involving Hurons and Iroquois, French and British. Part of the Huron population had also been integrated into the Iroquois Confederation. The survivors of this tragic episode divided into two groups: the Great-Lake Wyandots and the Huron-Wendat, who were the ancestors of the Huron-Wendat of Wendake. This marked the beginning of a period of exile for the three hundred (300) or so Wendat, an era during which they would occupy as many as six (6) different sites in the province of Quebec before settling for good in the village of Lorette (which was until recently called the Huron Village) in 1697. First established on Orleans Island in 1651, the community moved to Quebec City in 1668. Subsequently, the Wendat temporarily resided in Beauport, Notre Dame de Foy, Ancienne-Lorette and then the New Lorette in 1673. To consult the photographic index of the Grand Chiefs of the Nation, please click here. In 1997, the Huron-Wendat people celebrated the 300th anniversary of Wendake. 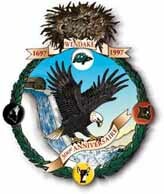 The emblem of Wendake's tri-centennial celebrations is the proud and powerful eagle, the spiritual link between human beings and the Creator. The eagle is flying over the Kabir Kouba Falls to announce the celebration and to protect the people. A crown of sage decorated with the head-dress of the Traditional Wendat Chief encircles the proud bird. The four colours of the inner circles represent the four cardinal points; they are in line with the angle of the illustration of the falls. The interiors of the circles represent the four Wendat clans: Bear, Deer, Wolf and Turtle.